Content process planning is experiencing a shift. And it is a result of the shift in the way people search for answers. Instead of going to the computer and typing two or three keywords, people today search the way they talk. They ask a specific question, often via voice on their phone or tablet. And of course, everyone has slightly different ways of asking the same question. That makes it really, really hard to cover all the possible keywords. What that means is that search is no longer just about keywords. We want to focus our efforts on owning a topic and delivering pertinent and engaging information around this particular subject. Let’s learn how pillar pages, topic clusters and subtopics help to organize and enhance content, while improving SEO for the way search engines work today. Think of a pillar page as a comprehensive resource on a core topic and the basis on which a topic cluster is built. A pillar page covers all of the aspects of a given topic on a single page. Pillar pages aren’t about detail though. One of your pillar pages should broadly cover a particular topic and the cluster content should go into more detail (addressing a specific keyword) that is related to the topic. So, go ahead and think about your first pillar page. No seriously, do it. I know it’s tough but try for a minute to stop thinking about your website in terms of just keywords. Think about a TOPIC for which you want to rank. Your pillar page should answer any question that someone may search in a search engine. The goal is for them to get their answers by first clicking to your pillar page for a high-level answer. Then they click through to the subtopic pages to receive more specific and detailed content. And it’s all linked (think of a hub and spokes), which allows you to use your subtopic blog posts to build authority. A topic cluster is composed of a pillar page and subtopic content that you have organized to support each of your core topics. A topic cluster (to be effective) should contain around 6 - 8 subtopics that address specific questions your customers may be exploring or to address specific pain points they may have. Do it: Create a new topic cluster, and name it something that summarizes the core topic it will address. There are still a few “rules” that we need to follow to determine and validate that writing about a particular topic is actually worth it. Domain Authority - Can you land on page one eventually? Monthly Searches - How many times is the term searched per month? Search is constantly changing, which is tough for us, but great for the user. And it’s imperative as marketers, that we always keep the needs of the customers at the center of our strategies. To stay current, you have to look at your content strategy as a dynamic and flexible way to attract and educate the right customers at the right time. 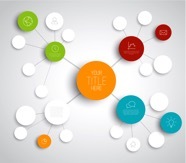 Topic clustering is a way to meet that need.